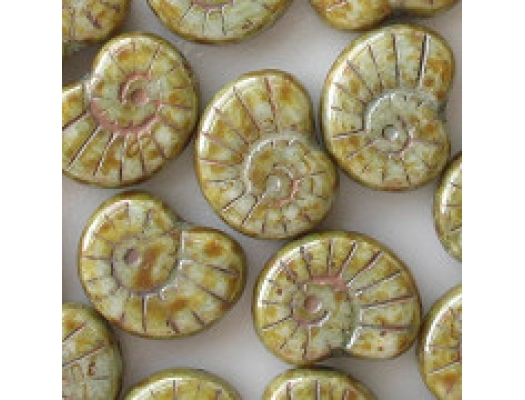 17mm-long, 13mm-wide, nautilus-shaped beads. The hole runs through the long dimension. Frankly, I am not sure if the underlying bead is white or light green, but the overall effect is light green, so I am calling them light green. 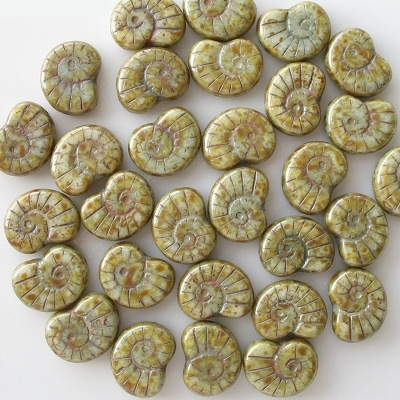 So these beads are opaque light green with a yellow-brown picasso coating and some pink in the spiral groove in the middle. These beads do indeed have a defect, but it is so minor that I feel it is unimportant (and I haven't reduced the price). In the spiral groove in the middle of the bead (where the pink color is), some beads have small fissures that probably can't be seen with the naked eye. I only noticed it when I looked at the pictures. There is no evidence that these beads are weak or will break. 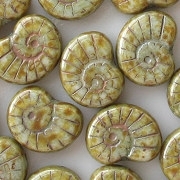 Also, not all the spiral grooves have pink in them, but most do. These may be my favorite of all the premium beads. The shape is wonderful, and the colors are so sophisticated. The picasso coating is very well done.